Seriously though I love going to BarCamps. Last weekend I went to my fourth one of this year (7 in total) and I still can’t get enough of them. 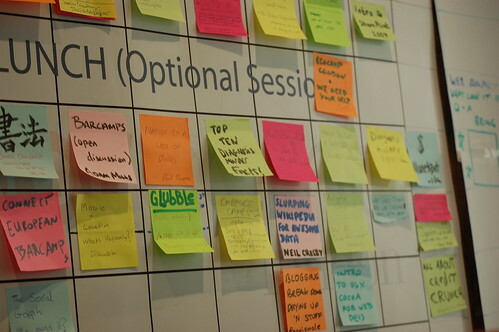 They are like the perfect event: great sessions, great conversations, great people, but most of all a great atmosphere. I always come out of a BarCamp feeling as if I’m capable to do anything I want. So how did BarCampLondon5 compare to previous ones? Pretty good, great actually. I still haven’t had a “perfect” BarCamp, mainly because there are so many different aspects that can make or break for you. For instance, BCL3 at Google had the best food and a great venue, but I didn’t choose the right sessions to go to, so it didn’t feel as if I really learnt anything during that one (plus there wasn’t enough Werewolf!). The opposite has also occurred though: sessions yay, food bleh. So like all previous BarCamps, this 5th London one also had it’s highs and lows (although I might be a nitpicky). This BarCamp was held at the eBay offices in Richmond, picturesquely situated by the Thames. I loved the layout of this place for a BarCamp. On the upper floor there were a couple of smaller proper session rooms with projector, lots of light and big meeting style tables. Downstairs were the more quirkier type rooms, with bean bags, flashy chairs and couches. I must admit I was a bit disappointed there wasn’t a “working scale replica of the Enterprise bridge from Next Generation” (yeah, I can be a bit gullible), cause I was hoping for another swede! A great surprise were the showers in the basement (there’s nothing worse than smelly geeks), although it would have been nice to have known that beforehand; practically nobody had taken towels with them. Enough with the pizza already! 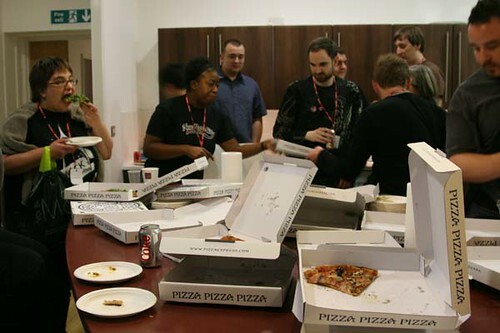 Why is there almost always pizza as dinner during the London BarCamps? I mean, I’d actually be fine with it, if it arrived nice and warm and steaming, but it’s always, always cold. Blegh. The rest of the food though was pretty good. During both days the lunches were sandwiches and bread rolls, with lots of brownies added as extra (I might have been one of those people who first grabbed 4 brownies and then went on to the normal food). The Sunday breakfast provided by myMuesli was delicious, although I think I’ve discovered that I’m allergic to mango (another post will follow). I love that there was actual orange juice available during breakfast, but I’d prefer that too for the rest of the day instead of only fizzy drinks and coffee. All in all though, great food! I have to make a point out of this. Neil already wrote a blog post about this and I fully agree. From the 150 who had signed up, more than 40 people didn’t show up. Seriously?! Guys (or gals) have at least the decency to cancel your ticket and let someone else go in your stead. The tickets for BarCamp are so coveted; there’s always such a fuss of making the cut and getting the ticket. And then people don’t show up?! Sorry, but that just pisses me the hell off. Free stuff! Most events have a goodie/schwag bag, but with this one two things stood out to me. For starters, the eBay picnic blanket. It’s cute and small with velcro to fold it up in a neat little bundle and perfect for on the couch! Secondly, the t-shirts. Now some of the previous BarCamps also had t-shirts, but I think (correct me if I’m wrong here) this was the first one with girly sized tees. Woot! I’ve been complaining with previous events that you’ll always get this weird oversized floppy guy t-shirts; perfect as pajamas, but unusable for anything other than that. Here though there were comfortable lady sized shirts (I’ve even worn mine outside already). My only nitpick here though is that they had way more S than M or L. To put it in perspective: I just fit into the M size. Who would have fit into the S? This was the second time I decided to leave my laptop at home and I really like not having it with me. The first time I left it because of hardware reasons (the rubbers that are supposed to keep the hard disk in it’s place came out while replacing it and now the hard disk is kind of loose), but since then I’ve noticed I’ll enjoy a BarCamp more without one. That’s mainly because instead of playing around with my laptop, I’m paying way more attention to the sessions and throwing myself more into them. I know it won’t be for everyone, but give it a thought before your next BarCamp. Unlike a couple of previous ones the introduction session was great: snappy, to the point and no-longer-than-needed. Some people have complained about the point of the three tags round (every single attendee introduces themselves plus three tags), but I’ve always found it pretty interesting. Especially for newbies, it’s a great way to make clear that EVERYBODY participates. The wrap session though… Well, let’s put it this way: for me there was no wrap-up session. The last session was supposed to last till 16:00, so we stayed put until the end. Only to discover when we came downstairs that they already had had the wrap-up and clean-up. WTF? True, we had been warned 15 minutes earlier by another attendee that they were rounding people up, but we didn’t think that it would be that quick. We also had no idea if there were any plans on going to a pub for post drinks or anything like that. It just ended so abruptly, it really ruined the afterglow of BarCamp. A quick introduction by Stef Magdalinski on how the Moo API works and some cool examples that were already made with it. Great discussion led by Rain which started about why there aren’t that many (barely any) woman conference speakers. It quickly turned into more of a discussion of the confidence of woman in tech in general, which of course will influence their readiness of being a speaker or not. If you want some more info, Rain’s got a great summary of it up on her blog. Cool mini workshop from Simon Maddox on how to develop an iPhone app (and why his wasn’t accepted into the App Store). I already was interested in Cocoa development, so this was a nice add-on. 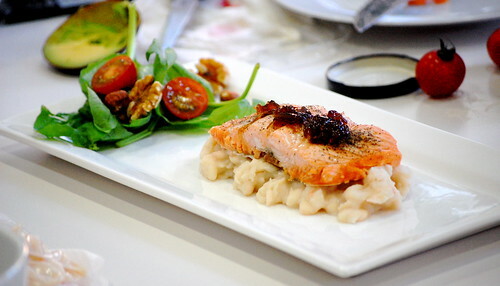 Delicious food-tasting! I thought this session was going to be some simple recipes shown in a slideshow, but it was an actual hands-on “lets cook some stuff” session. We had: Microwaved Salmon on a bed of Mashed Cannoli Beans, Chocolate Dipped Strawberries, Thai Chicken Shrimp Noodles (created with Pot Noodles! ), Eton Mess, and Salmon/Avocado Sushi rolls. I was planning on holding a short session about Operation: Sleeper Cell (again another blog post will follow some time this week), but decided on the day itself I could easily blabber on about all the different ARGs I’ve participated in. So I talked for an hour about The Dark Knight, We Tell Stories, The 7th Syndikate and Operation: Sleeper Cell. First session I’ve held at BarCamp that I’m actually proud of! Interesting session from Dan W about how data should be structured on the web. Sites such as IMDB and Last.fm should take care of their respective subjects and act as Data Silos, which other types of apps like Viewers can access when necessary. Check out the slides. This was a small session hosted by Cristiano, where everybody just showed up with their own gadgets and was allowed to play with other people’s gadgets. I brought my Nintendo DS with a couple of the games I own. I ended up “playing” with Sam’s laptop, just checking my email/twitter/etc. I ended my BarCamp with a great session of Karaoke singing. It wasn’t only singing; we were beta-testing the new app from Lucky Voice. We might have scared a couple of people away though; it wasn’t our singing, honest! All together, it made for a great BarCamp. Kudos to eBay for hosting and organizing it and all the sponsors for making such an event possible. Next up: SocialMediaCamp this Saturday! I can only hope it’s a good as this one.